Sridevi - we nominated you for excellence in teaching. Here is my nomination. 14 years ago, I chose Sridevi Thirumalai to be our daughter’s teacher - it was one of the best decisions I made for Arya. Not only did Arya (and her fellow students) complete her Arangetram successfully, but along the way she learnt Indian culture, tradition, art and discipline. Sridevi, therefore, has had a transformational effect on her students’ lives, not just Bharatanatyam. Under her tutelage, students revel in the rigid and strict interpretation of the dance form. They are able to accommodate the ancient Indian tradition of guru-shishya parampara with different perspectives in their school system. Students grow to love the practice, learn mutual respect and establish a unity of purpose between her and themselves, ­ which are the pre-requisites for wholesome learning as the shastras tell us. Last summer (2013) I went to India with Sridevi Aunty and completed my Bharathanatyam Arangetram. I can never repay Aunty for the experiences and lessons she taught me during my Arangetram process. She taught me to pursue excellence tirelessly and persistently. She taught me what difficulty and pain and exhaustion really were and to never give in to any of those things. She taught me that I could have the moon if I so willed it; if I work hard enough I can have anything I want. She taught me that limits don’t exist and to take life as a challenge – a chance to prove that you can. She taught me how powerful I was. And for everything she taught me, she gave me so much more. Aunty always believed in me, even after I had given up on myself. Her overwhelming belief in me was the driving force behind my accomplishments in India. Aunty instilled in me a profound faith in the power of hard work and perseverance. She gave me experiences that will last a lifetime and lessons that will last for many more. She gave me the world of dance – a place I could come even on the hardest of days to feel beautiful and powerful and loved. She made me a better dancer, but, more importantly, she created the person that I am today. Everything that you accomplish in life, you owe to your parents. Since my Arangetram, I have owed everything that I have accomplished to Sridevi Aunty as well. Thank you so much for everything. I hope you are back in US after a whirlwind tour. I have no words to explain my happiness and joy to see your troupe dancing. It was simply enchanting, gracious, involving the audience as if they are also dancing and one of the troupe. There was no time for you to meet and talk to your admirers and well wishers because of the tense itinerary. Your disciples danced in such a way – true to my heart, I am expressing this view – that they were super. In our ordinary day-to-day talk if I were to appreciate how the Dance was, it was BOMBAT. YOUR DEDICATION AND COMMITTMENT TO THE CAUSE OF DANCE WAS WELL EXPRESSED AND THAT IMPRESSION AND INFLUENCE WAS CLEARLY DEPICTED IN YOUR STUDENTS DANCE. I NAME YOU TODAY AS 'NATYA THAPASVINI' BECAUSE OF YOUR GREAT CONTRIBUTION AND COMMITMENT IN THE FIELD OF DANCE. Natyamani School of Dance has kept the heritage of Bharatnatyam alive far from India without corrupting the traditions of the Guru-Shishya parampara. I have watched my daughter learn dance, and over the years she has imbibed more than Nritta and Abhinaya...she has learnt commitment to this classical form of art. She has learnt what it means to represent her dance teacher and her school when on stage, and has developed a strong sense of what her choreography means, not only to her but to her co-dancers. Like all her classmates she could not have achieved these milestones in classical dance without her Guru and Natyamani School of Dance. The Natyamani school of Dance represents the teachings in the Natyashastra, by cultivating in its students a strong sense of being modestly dressed in traditional costume, jewelry and make-up, having a grasp of music and rhythm, and having a sound knowledge of mythology, along with a clear awareness of the dimensions and symmetry of the stage and the dancers' presence in it. Most importantly Natyamani School of Dance has imparted in my child a genuine love, pride and respect for this sterling dance form. It was truly a mesmerizing and absolutely memorable Annual Day this year. All the kids did a wondeful job. I loved the Varnam, Kanchadalayadaakshi and Bo Shambo very very much!! After those days, yesterday was the first time in 15 years that I got to watch such a fantastic show! The show has really instilled a desire to continue to learn dance within me. HATS OFF to you and ALL the KIDS that put up such an awesome show. I can truly say that the years that I spent with Natyamani School of Dance are years that I greatly cherish. The knowledge and talent that I have gained through my classes have been invaluable. It has given me an unmatched insight into the roots of my culture while simultaneously teaching me priceless life lessons. In a time where the contemporary movement is reaching its peak, Natyamani School of Dance represents classical dance at its best and continues to outshine them all. Naturally, none of this would be possible without the spear head of this school, Guru Sridevi Ajai Thirumalai. As her student I can tell you that her critical, yet caring eye transforms you into the best dancer you can be. She pushes you when she knows you are capable of more but also recognizes when you are not ready. Her faith in you is what allows you to have faith in yourself. I am never surer of myself than when I am dancing and that confidence in my ability to execute successfully as a dancer is unsurpassed by nothing else. There is a discipline that I gained with Sridevi Aunty that I have learned to apply in my personal and professional life whether it is college, work, or simply hanging out with friends. On the note of friendship, some of my greatest memories are those with the friends that I have made through dance who are now like my family. It is a great experience performing with your peers and an even greater experience performing with your guru, all who share a passion like your own. 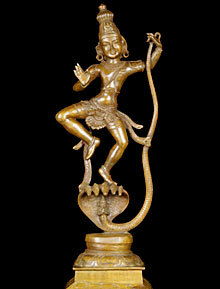 Through dance, especially the several months I spent training for my Arangetram, I learned many things about myself. My body was willing to take on a lot more than I realized and the mental strength I built to even allow and make that happen surprised me. Only Sridevi Aunty can get you to break such boundaries within yourself that you otherwise didn't realize existed. The rigidity and structure in Bharatanatyam, both physically and emotionally, requires an endurance that is otherwise hard to master without someone like Sridevi Aunty to guide you. Today, if I fall short in anything that I do, I don't give up because I have seen what I am capable of doing through the years I have spent with Natyamani School of Dance. I had reached my own personal high through this school which is a feeling I try to re-create in everything I pursue. The journey I began as an eager and excited 5 year old has been one of my most cherished life experiences. Now, 15 years later, I still feel that same rush and excitement whether it's walking into dance class or walking on stage. Needless to say, I owe much of who I am today as a person, and all of who I am as a dancer to Natyamani School of Dance and my Guru Sridevi Ajai Thirumalai. It was love and first sight when I saw Sridevi Ajai Thirumalai perform on stage. I was with a dear friend who shared my passion for dance, and we were both awe-struck. We had seen several dancers (classical and non-classical) in our lifetime, in India and in the US, but it did not take us long to realize that Sridevi was a cut above. She mesmerized with her Abhinaya (facial expressions and body movements leading the audience towards a sentiment), which transported us to the world where her narrative was happening. Her fluid and graceful body moved confidently - knowing how to bend and where to gaze – taking us right into the story with her. We were there - happy with her, sad with her, and sharing her every emotion. Her Nritta (intricate footwork)was always fascinating with rapid rhythmic steps set to the beat, or even more alluring, set off-beat in parts, always converging to meet the beat at the end of the Jati (short rhythmic pattern). Her extraordinary choreography left us wondering how she imagined the item - I truly wanted to get into her brain to see how it functioned and what neurons were firing during the time when she created the piece. Soon I began stalking her…going to all her performances. Each time, those few hours with her on stage were a treat! At one of these performances I had my “Aha” moment. I promised myself that if I ever had a daughter I would request Sridevi to be her Guru. Fast forward to many years later when this same friend’s daughter joined Sridevi’s dance school and I had an opportunity to watch this child grow to be a mature dancer under Sridevi’s expert tutelage. A few more years later this child had a full-fledged Arangetram (solo dance debut on stage). I lived vicariously through my friend and her daughter. What an experience it was! That was 2004. In 2005 my own daughter was six. I enrolled her in Natyamani School of Dance with Sridevi and that was when I started my personal joy ride. Sridevi started my daughter out with the foundation of Bharatanatyam – Adavus. She was patient yet simultaneously set very high standards upfront, inculcating the love of dance within my daughter while reinforcing the discipline of practice. Sridevi reminds me of the Goddess Durga that she depicts so well in her dances – she is a supremely radiant embodiment of a creative feminine force. I was so inspired by her that even as I sat as a spectator with all the other parents, I felt my body swaying to the rhythm and the songs as she conducted lessons. In 2007 I picked up the courage to ask if she would be willing to take me on as a student. Sridevi blew me away not only by accepting me (a woman on the wrong side of forty) as her student, but by encouraging me every step of the way. Through Sridevi, my daughter and I now share yet another bond – we look forward to our saturday afternoons at her dance class. Thus our family has been blessed with an art experience of a lifetime. Thank you Sridevi – we are indebted to you! Natyamani School of Dance (NSD) and Sridevi will always have a special place in my heart. I took my daughter to visit Sridevi when she was 4.5 years old. My daughter was a student in the school and achieved many dance milestones as a result; however the lasting feeling for both my daughter and me is one of great love, deep gratitude, admiration and respect for NSD. Through the years, I saw my daughter’s personal growth extend beyond the art itself - under her teacher’s guidance as a true - Guru and Shishya relationship. And when all is said and done, it is the relationship that is ever-lasting even when the dance comes to an end. I attended Neha's mama's wedding in Ahmedabad on 6th and 7th March. On 6th Neha performed a bharatanatyam recital before reception. It was her first after arangetram. It was wonderfully well done. Her eye movement, anga-sanchalan, nritya-mudraas, expressions – all were superb. The credit goes to you. Neha was telling me that you are strict and nice, and that is how a guru should be. Kudos to you. I really appreciate you for your endeavour and hard work in creating such good students. You are doing a great service to our nation by keeping our Indian traditions alive in a foreign country. My heartfelt thanks to you for this. May God almighty shower his blessings on you. Completing my Arangetram was one of the most rewarding experiences of my life. Sridevi Auntie is such a huge inspiration, and I enjoyed every minute of working with her. She is kind and generous, yet she expects a lot out of her dancers. Not only did I learn several dances, I also gained valuable skills like time management and discovered the true art of solo performing. Completing my Arangetram was a dream come true, and I will always cherish each moment. My daughter has been learning Bharathanatyam, an ancient Indian classical dance form, from Smt. Sridevi Thirumalai for over a decade. Recently, my daughter was fortunate enough to perform her Bharathanatyam Arangetram under her guru’s disciplined and skilled guidance. Sridevi is a compassionate, dedicated teacher and a divine dancer. In fact, in my opinion, she is one of the best Bharathanatyam teachers in the New England area. She brings India’s rich traditions and customs to all of our children in the western world. Through her Natyamani School of Dance, Smt. Sridevi Thirumalai is committed to propagating this beautiful art form. Bharathanatyam has taught me discipline, dedication, and perseverance. This intricate art form has opened my eyes to a rich Indian culture and an honorable heritage. I am honored to be a student of Sridevi auntie and I am forever thankful for the talent that she has instilled in me. Our daughter Neha has been a student of Natyamani School of Dance for the past 7 1/2 years. She is blessed to have taken lessons from Sridevi, who has inspired her by her love and dedication for this ancient art. Being a strict disciplinarian, she has done a wonderful job of maintaining the Indian tradition in a foreign country. We would strongly recommend her to any parents who are looking for a good Bharatnatyam teacher for their children. We still remember the day we met her – just came to U.S. as a new bride. She wanted to start teaching Bharathanatyam classes...It still seems like yesterday. I do not know where the time went. It was our pleasure knowing and working with Sridevi and her family for the past 20 years. The Thirumalai family became part of our family. She is the most talented, and disciplined teacher. She challenges her students constantly, and brings out their best qualities. Sridevi instills great values in students. All of her students learn many other skills along with dance, which they do not learn from school or parents. Sridevi makes every Arangetram as her personal event, and her entire family (including her parents) provides a great contribution. Having Sridevi’s parents helped us tremendously during our daughter’s Arangetram, making it all the more special. Thank you Sridevi and Ajai! CONGRATULATIONS AND BEST WISHES FOR A BRIGHT FUTURE!!! I have been learning the art of Bharatanatyam dance under the guidance for Sridevi Aunty since 1997. Not only did I learn the technical aspect of the beautiful dance form but I also learned the spiritual aspect. I learned grace, emotion, strength, discipline, faith and confidence. Yet, one cannot grasp such complex ideas without being taught through clarity, encouragement and love for the art form. Sridevi Aunty encompasses all those qualities and much more. Her passion for this dance style and her enthusiasm for teaching give her the ability to transfer that same passion and zeal to her students. I have learned so much from her and this classical dance style - from the basics of catching a beat, grace in my arm movements to confidence and vigor in everything I do and finally to develop the art of choreography – Sridevi aunty has helped me to grow as a person and as a dancer. She teaches with compassion and courage and has a motherly love for all her students. She strives to make you the best and engraves the values and life lessons of our culture and religion in our daily lives. She doesn’t simply teach one to stamp or to make certain hand gestures but also the colorful stories and tradition behind Bharatanatyam enriching your overall experience. She has been so influential in my life and I have become the person I am today because of a number of values and virtues I have imbibed from Sridevi Aunty’s teachings during all these years of training. I attended the program (Kaladarpana) in Jayanagar on 27th. All the girls danced professionally. The choice of songs by the Guru Smt. Thirumalai, particularly those of Adi Sankara were elevating. In these days of kuthu dance in India's films, Boston girls have made India proud. Kudos to all. Congratulations. Best wishes and sincere prayers for many such laurels. All the girls did such an awesome job, KUDOS to you and the girls. On behalf of NEKK Ratna Mahotsava Entertainment Committee, it gives me great pleasure to personally thank you for the wonderful Kanaka-Purandara performance by the students of your school. We received a lot of positive comments about the enchanting dance performance given by your students. We appreciate the special interest you took to prepare the dancers for this show. Please convey our heartfelt thanks and appreciation to all the parents and children. Thank you very much for all your efforts and time, which made our celebration even more colorful and professional. It was amazing to see such precision by young students and everyone enjoyed the presentation very much. It was a great pleasure and real treat to be there at Tridevi Samarpanam. All the programs were wonderful and your dance program with your students was exceptional. I truly felt that I was looking at Sita devi. My son Ananth's music teacher had also come to experience Indian classical music and dance and she loved the entire program, especially your expressions and dance form. Thanks. It is due to the overwhelming joy we felt there I have taken the liberty to email you. I had your email from my friend Shalini's party. I hope not to be mistaken. Hoping and wishing to see many more such programs. It was a very beautiful event yesterday. I was just reflecting back to when Neha had started, and now where she is, because of years of training that you have provided. You did a beautiful dance, and I am very impressed by the way you have maintained yourself. Along with the other girls you looked just like one of them! Looking forward to the rest of the programs! Congratulations on a fantastic presentation as usual on Annual Day. My mother-in-law said you were like an apsara dancing. Thank you for the hard work with the kids. Your dedication to dance and to kids really paid off in the form of a beautiful performance by each of the students. Once again congratulations on the success of the Annual Day . Hearty Congratulations from our family on the 20th Anniversary of the dance school. I don’t have words to describe yesterday's dance performance. It was simply superb. Thank you for being a part of this fundraiser. Please accept our congratulations once again, on a scintillating performance by your student Sneha Rao. We thoroughly enjoyed your choreography, and every one of your pieces. Yet another beautiful feather in your, I'm sure overflowing, cap!